Us Chicagoans have Spring on our minds. It’s all we can talk about during these lingering days of winter. Spring officially begins for on Thursday at 11:57 am with the vernal equinox! Our weather forecast for the first of Spring is partly sunny with a high of 44 degrees. I supposed that’s a little better than today’s 34 degree high. I know we’ve been complaining about the weather lately, and how it seems like this winter is so, so long…but we still have a week to go until Spring Break, and here’s my picture of the first day of Spring Break last year! Chicago, snow, and March go together, even when it’s Spring! To celebrate the arrival of Spring, we’re spinning about it this week. Link up your post about Spring; spring break, spring training, a spring in your step, anything to do with Spring! 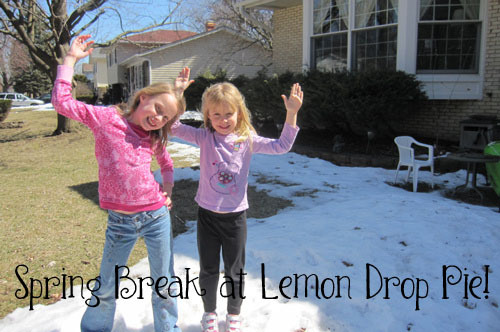 Gretchen and I will share our Spring posts on Friday. We have had glimpses of warm weather here. I will be glad when it is here to stay. Me, too! The kids can’t wait until it’s warm enough to play outside all day long. Oh yay! My scheduled Wednesday post is TOTALLY about winter ending. I’ll be sure to link up! I may have to set myself a reminder. Our warming trend starts tomorrow. It’s supposed to be 41 and then gradually climb to around 50 for the weekend. It’s coming. It’s really coming! tamaralikecamera recently posted…The Beauty In The Sick Day. We’re supposed to reach 50 today! I’m so excited. 🙂 Looking forward to having you link up this week! I can’t wait for spring, either, though in Michigan it looks like it could be awhile (though the weatherman is talking some 40s this week). If you have time, I’d love if you’d stop by and link-up this and any other spring, “green”, Easter, etc. post to my Think Green link-up. If you can’t, I understand, but I’d love to have you! I am featuring some favorites on Saturday, March 22nd, as well. Hope to see you there! Have a great day! Great! I look forward to it! 🙂 Thanks! I can’t wait until the warm weather. This will do nicely! Thanks for hosting! Can’t wait for spring around here! Thanks for linking up! It’s supposed to be in the 50’s today by me. Wa-hoo! The girls look so cute. Enjoy Spring break! Thanks, Debby! That picture is from last year, and our break starts next Monday. I’ll have to post an updated picture because the girls have grown a lot in just a year! Thank you for linking up, Janine! We are expected warmer weather today…finally!